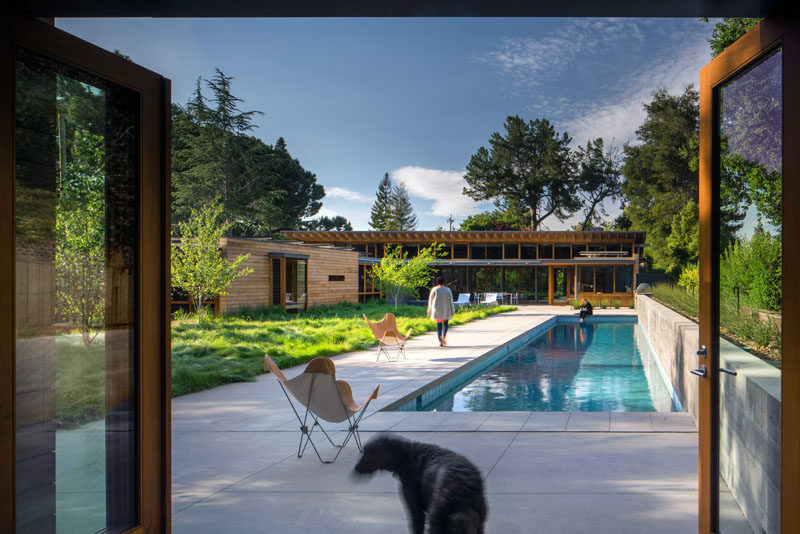 Architecture firm Bohlin Cywinski Jackson have designed this modern family house (with guest house) in Los Altos, California, that’s a re-interpretation of a Northern Californian ranch style home. 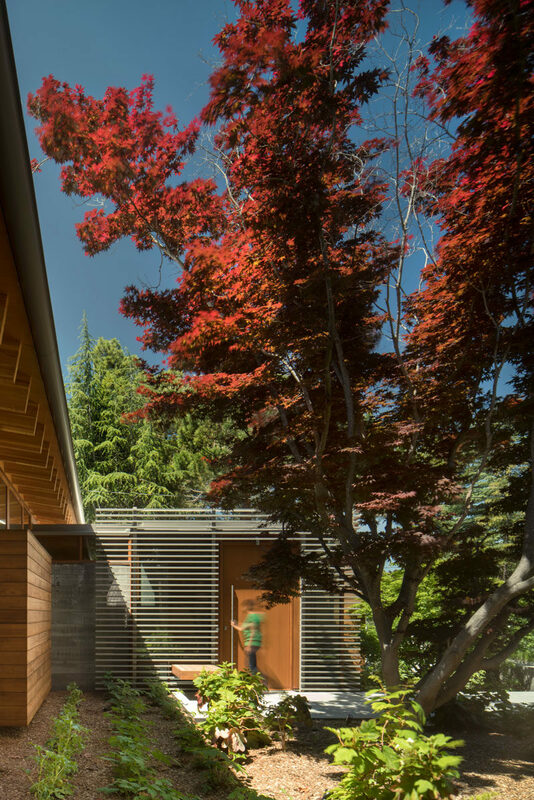 The single-level home has been designed around an existing Japanese maple tree, and throughout the home a variety of woods like Douglas fir, western red cedar, and gray elm, have been used to create a sense of warmth in the home. Stepping inside, the home opens up to the main living space that has a double-height wood ceiling, and is home to the kitchen, dining room, living room and textured fireplace. One of the main elements in this living space is the large locally sourced live edge Claro walnut table that measures 10 feet in length. 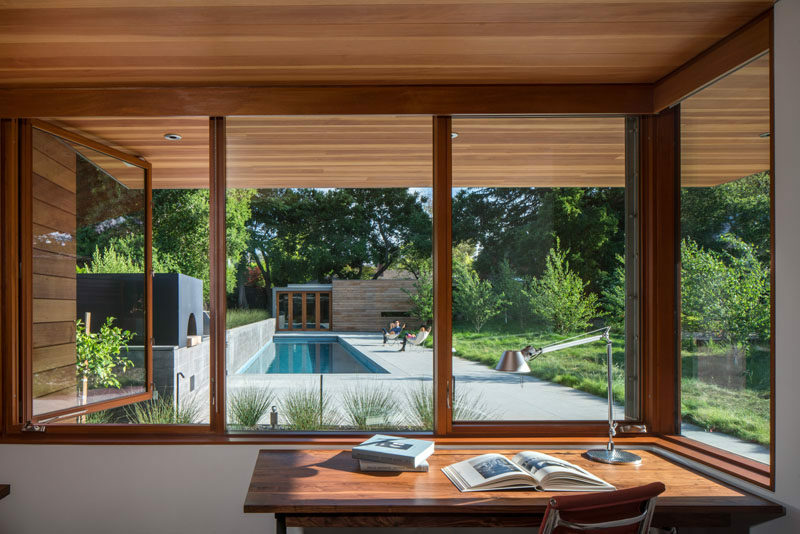 Another design element are the operable windows and clerestories that allow the home owners to take advantage of the cross breezes to naturally cool the house down. Sliding glass doors open up the main living area to a partially covered patio that blurs the line between indoor and outdoor living. 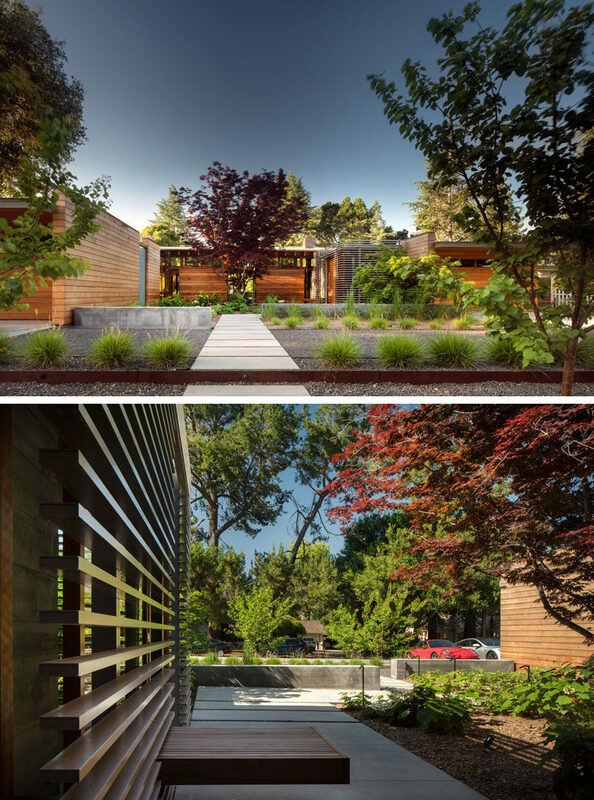 Every room in the house, like the home office, has views of the garden designed by Andrea Cochran Landscape Architecture. 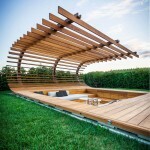 There’s a meadow with long grass and trees, a contemplation garden, a swimming pool with patio, and an outdoor kitchen that sits alongside a board-formed concrete garden wall. At the end of the pool is a small guest house with a bedroom, living room and bathroom. 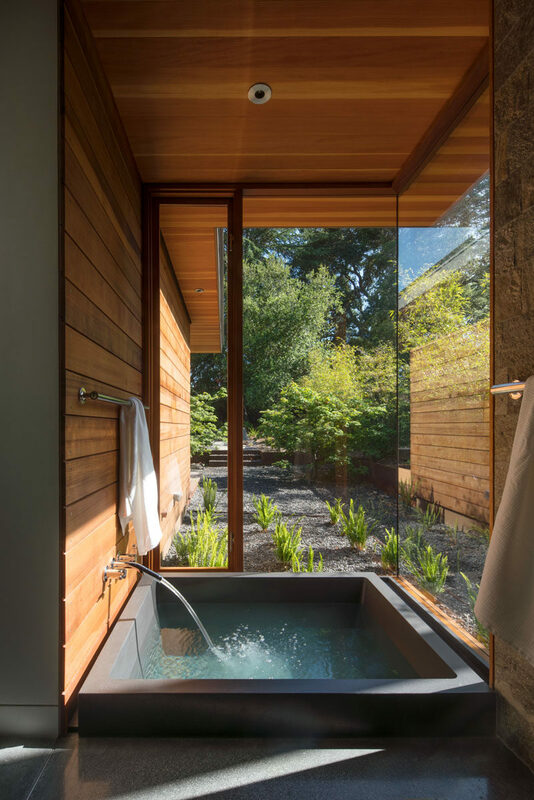 Just off the master bedroom is a private spa that’s sunken down into the floor and looks out to the garden through the floor-to-ceiling windows. 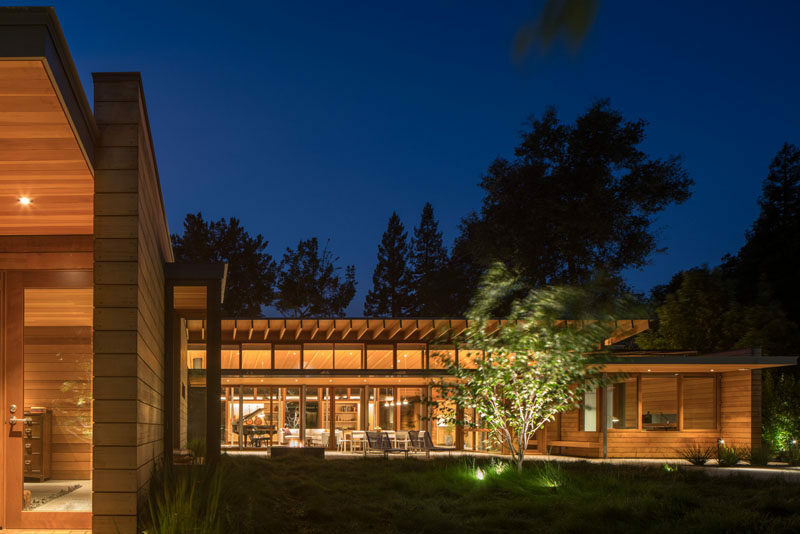 The architects worked together with BANKS | RAMOS Architectural Lighting to ensure the house and meadow are lit up at night, perfect for evening entertaining. 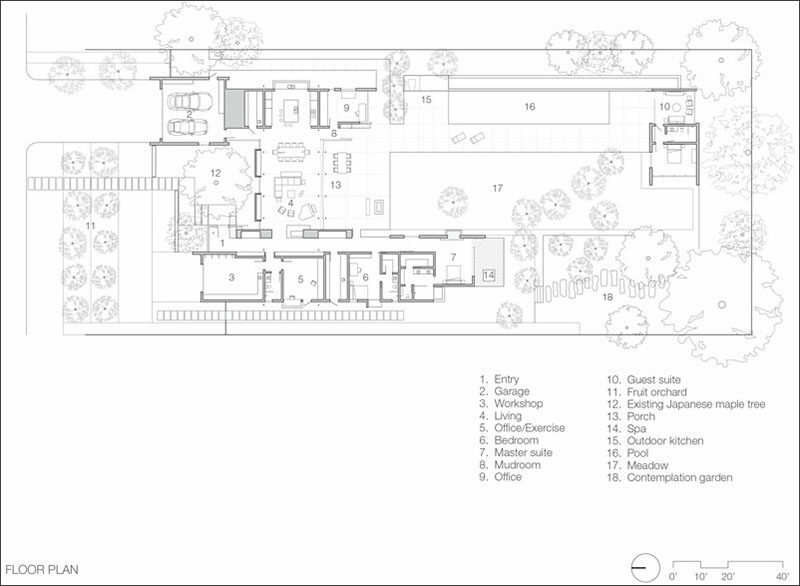 To understand the layout of the home, here’s a look at the floor plan.